my class read this book and we all absolutely loved it. as proof every time we have to stop there is a collective groan and each time it gets louder!I absolutely love reading and now I want to read more and more of varjak paw the outlaw!!! How ever did you think of such exhilarating ways to put your wording? Are class really enjoyed reading Varjak Paw!!!! We loved it so much that when we finished reading it everyone cheered!! Could you please write a third Varjak Paw ( even though it might take you a few years)? I loved the detail you put into it and our teacher kept saying how wonderful it is!! When I finish the book that I am reading right now I will read the outlaw varjak paw. my name is heaven.How in the world did you come up with the idea of cats having magical powers?You are now my fav author PLEASE CAN YOU MAKE A THIRD VARJAK PAW!!! Do you have a cat?Your book is FANTASTIC. Thank you for your message – it's amazing to hear that your class enjoyed Varjak Paw so much! It wasn't an easy book to write; it took me 5 years. But my new book Phoenix took me even longer! Here's a link to a blog where I talk about my writing process, and give some tips for writing. I hope you find it interesting! Thank you so much! 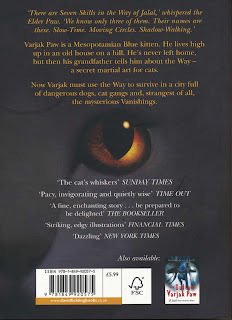 I don't have a cat at the moment, but I did when I wrote Varjak Paw. And that cat's name was... Varjak Paw! Thank you so much for your amazing messages! I am definitely planning to write a third Varjak Paw book one day – here's a link to a piece where I wrote all about my idea for it. Thank you so much for your amazing comment, and for inviting me to visit your school! Please could you ask your teacher to get in touch with me, so we can talk about it? If they could leave me a message here or on my author visits page, with an email address I can reply to, that would be wonderful. It's very nice to hear from you! Thanks for replying. You asked where my school is and the answer is New Zealand! And not just any place in New Zealand. I live on a tiny island of about 9000 people (but it's a tourist island so the population rises in summer.) It's called Waiheke island. I am meeting with the principal next week to confirm details about the varjak paw show. I am very excited for the show as is the rest of my class. That's amazing to hear – I had no idea Varjak Paw had travelled so far! If you do the show, please let me know – I'd love to see some pictures/videos. I might even make a blog about it! Thank you for your message! I'd be very happy to sign a bookplate for your friend that she could then stick into her book. If you'd like me to do that, just leave me a message with details of who to sign it for, what you'd like it to say, and where I should send it. If there's a way to post my mailing information privately, that would be cool. Just sign it for Gillian and have it say "Hope you have a great Christmas, Gillian!" With you signature on it somewhere. So yeah, that would be pretty cool and thanks. That's fine, I'm very happy to do that. Just leave me your mailing information in a comment as normal - I won't publish it, so no-one else will see it! My name is John and I am 7. I'd like to know why you started your story with a quote from The Wizard of Oz? Thank you very much for your message. One reason why I started Varjak Paw with that quote from The Wizard Of Oz is because I like The Wizard Of Oz! But another reason is that I don't like the way The Wizard Of Oz ends, with Dorothy just going home after all her adventures. I think a lot of traditional children's stories end that way, but I wanted my story to be different, with Varjak realising that he couldn't now stay at home; his future lay out in the world with his friends. So that quote is used a little bit ironically, as this review in The Guardian picked up. I was looking the Varjak Paw books up to see if there was a third and came across this. I'm just leaving a comment to say that the Varjak Paw books were a couple of my favourites that I read as a child (I'm 23 now) as well as The Outsiders by S. E. Hinton and the HP series. Thanks for your amazing writing that takes children completely into another world. Thank you so much for that amazing comment! It's brilliant to hear that you still remember my books, after all this time. I always hoped they might be the kind of books that people kept and re-read again as adults. And I'm a huge fan of SE Hinton and Harry Potter too, so that really means a lot. There will definitely be a third book one day – I wrote a bit about my idea for it in this blog post. Last time I wrote to you I mentioned putting on a show. Well, you'll be be happy to hear that we performed the show about a week ago! All the performers loved it and we got lots of praise from the audience. If you like, I could send some photos and a video. I wish you a very merry Christmas and a happy new year. Ps. I'm playing Sally bones! I read the book Varjak Paw and The Outlaw Varjak Paw and let me tell you they were the best books I have Readin my almost 10 year long life. On 22-Jan 2017 the night I finished the book I couldn't stop thinking of even writing my own Varjak Paw related book. If you do decide cowrite a new book I would love for you to tell me just don't tell me when until it's almost published because I will end up counting down every day until it comes out. If you do decide to write the next book to the Varjak Paw series it would be nice if Holly tells everyone what happened after their last encounter with Holly before she sacrificed herself to help Varjak escape, and have her describe how she sees now. Also I feel as if Ginger and his gang should be in the book more. Thank you so much for your fantastic comment! That really means a lot to me. I am planning to write a third Varjak Paw book one day - I wrote a bit about my idea for it in this blog post. I don't know when it will happen, but it will definitely happen one day! And I think it will have something to say about what happened to Holly. In the meantime, have you read my new book Phoenix yet? It's not about Varjak, or even about cats, but I think it's my best one so far! Have you made your novels into a full length movie? My class loved the books and went they went to Youtube it said full length but nothing was there except clips. Looking forward to a third novel. Thank you so much for your message, and your kind words about my work! There hasn't yet been an official film of any of my books. All the clips you can find on YouTube are made by fans. Having said that, Dave McKean and I have tried very hard to get a Varjak Paw film made in the past - I wrote a little bit about it in this blog post. And we are still trying - we recently started to explore a new avenue. I hope there'll be news to share about this at some stage; please do keep checking in here, and on my Twitter feed, where I will certainly share any developments! Thanks again, and please give my best wishes to your class, and tell them to keep the Way alive! hello SF said I have read the first book 17 times and the second one 12 and I LOVE the both of them and I really want a third book holly getting killed of actually had me crying and I was really happy for her return I have spent countless hours theorizing about holly getting the ice blue eye please make a third book. P.S. Keep the way alive. You've read the first book 17 times?! That is amazing - thank you so much for your wonderful comment, it means so much for a writer to hear things like that about their work. There will definitely be a third book about Varjak one day - I wrote a bit about my idea for it in this blog post. Thank you so much for your awesome comment!!!!! We are a Primary 5 class at Wallace Primary in Elderslie, Scotland. 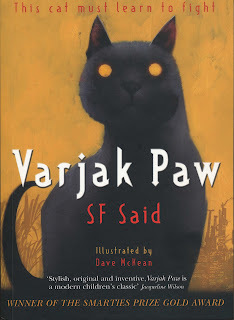 We have really loved reading all about Varjak Paw. We think it is the best book ever! During RE lessons, we have been learning about the story of Buddha and couldn't help notice lots of similarities between Varjak Paw and the Buddha story. We are really interested to hear your thoughts! Please write back to us! Thank you so much for your wonderful message! It means a lot to me that you've enjoyed Varjak Paw, and wanted to get in touch. To be honest, I'd never noticed the similarities between Varjak's story and the Buddha's story before reading your message, but you're absolutely right - there are a lot of them! I wonder if you could find any other stories that have similar features? We have just finished reading Varjak Paw at school. I loved it. For a girl who usually enjoys stories about people and ordinary life- I loved it. I think you are a great author and I hope to be one-one day to. Do you have an tips? Thank you so much for your lovely message – I'm really glad you enjoyed reading Varjak Paw! It's exciting to hear that you're interested in writing. I have lots of tips for you. Have a look at this blog post, which takes you through all the steps of writing – from having an idea, to writing a first draft, to editing your work. That should get you started! Good luck with your writing, and keep the Way alive! I am now 24 years old and first read Varjak Paw when I was at Primary School and picked it out from our book fair because the cover looked like our pet cat Suki. I just wanted to let you know that I still have this book on my bookshelf almost fifteen years later and I even purchased a much neater, less crinkled (I used to read Varjak Paw in the bath) hard back copy to hopefully pass on to my children one day. Whenever I felt upset or lonely, I would re-read my favourite two books on my window sill and was completely immersed in the world you created. I wanted to write and say thank you and I hope that one day we might get a third! Thank you so much for that incredible message! I still have a few books from my own childhood – only a few – so I know how much it means to keep a book for all that time. You can't imagine how much it means to hear that Varjak is one of those books for you, and has stayed with you through your life. We really loved your book, "Varjak Paw"! We enjoyed every single chapter (all 35 of them). We were very devastated when Tam vanished. We haven't read the second Varjak book yet, "The Outlaw Varjak Paw, but we would really love to read it. We hope that you write a third Varjak book. You are a wonderful author and we really dig your style and your expressive and descriptive word choices. We were wondering how Sally Bones knew "The Way" of Jalal and what happened to her eye. Thank you so much for your wonderful message! I'm so glad you enjoyed Varjak Paw. I don't find writing easy – Varjak took me 5 years to get right - so it means a lot to hear to hear things like that. I hope you will enjoy The Outlaw Varjak Paw too, and if you read it, you might just find a few more clues to your questions about Sally Bones. I am using your book for my university assignment and I was wondering if I could ask you a question. Is the physicality of the Mesopotamian Blue's based off of the Russian Blues? I only ask because the way you describe them within the book is very similar. I first came upon your book whilst on work experience to become a teacher. Thank you so much for using Varjak Paw! That's a very interesting question. It's true that the description of the Mesopotamian Blues is quite close to Russian Blues in real life - but to be honest, I wasn't thinking about that when I wrote it. I was mainly interested in the idea of Mesopotamia as the origin of human civilisation, and the place where humans and cats might have first lived together, and I wanted Varjak to go back to those origins in his dreams. And as Mesopotamia is the ancient name of Iraq and Persia is the ancient name of Iran, and there are Persian Blues in real life, I thought there could well be Mesopotamian Blues too, and then just described a cat with silver-blue fur. I hope that helps with your assignment!